Just as websites must be accessible for individuals with disabilities, documents posted to websites and distributed electronically must also be accessible. The most common document formats posted to websites include Microsoft Office documents and Adobe PDFs and it’s good to know that the applications used to create these formats include the built-in tools and functionality to format and check for accessibility. There are several key ideas to keep in mind when creating accessible documents. Accessible documents meet the standards and follow guidelines included in Section 508 and Web Content Accessibility Guidelines, WCAG 2.0. Accessible documents allow individuals with disabilities who use assistive technology to have access to the same information as everyone else. Very often, improving accessibility improves usability for everyone, and can also result in improved search results. The following tips and resources can help you make the production of accessible documents a regular part of your workflow and routine. Individuals who use screen readers need a means of identifying the “parts” of a document that sighted individuals identify visually, including titles, headings, and subheadings. When formatting a MS Word document using Styles to create Headings, you can ensure that both the visual cues are present and the underlying document structure, sometimes referred to as semantic structure that is conveyed to assistive technology. Semantic structure through headings provides individuals using assistive technology with valuable information about the document and allows individuals to navigate by headings, and directly access links, tables, forms and other sections of the document. Using Styles has other benefits too, including enabling you to easily apply changes and make updates throughout your document. Styled headings will also export to a number of other formats including PDF, HTML, EPUB, DAISY, and more. Other semantic information that can be accessed using screen readers include bulleted and numbered lists, tables and table headers, hyperlinks, and graphics. Using the built-in tools available in Word to format all of these components within a document will ensure greater access for everyone. Images and other non-text content require text “equivalents” so that users of screen readers will have access to the image information. To determine the alt text to add, determine the purpose and meaning of the image and write a short, to-the-point text equivalent. In most cases the alt text should convey the meaning of the image, rather than a visual description of the image. The AccessGA logo at the top of this page includes alt text that reads AccessGA: Georgia’s Accessible ICT Initiative. It’s important not to use color as the sole indicator of information. For example, an individual using a screen reader would have no way to know that the color red is being used to indicate that specific information is required. An asterisk with a key would be a better way to indicate the required field. Third party color contrast analyzers can be used to determine whether the color contrast used within a document is sufficient. Good color contrast is important for individuals with low vision, and it can also improve readability in general. Also, be sure to use color combinations that are accessible to individuals who are color blind. 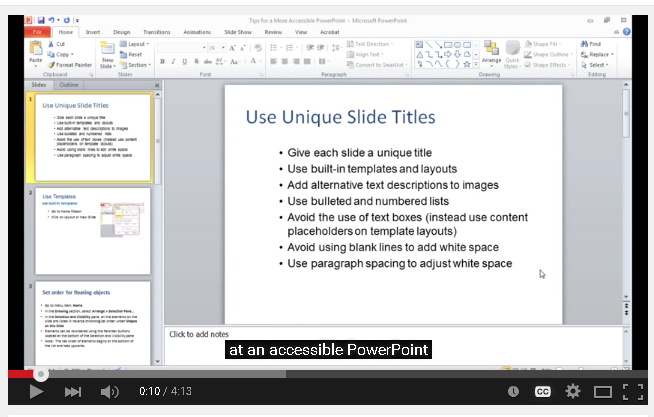 Check out this video demonstration to see how to format PowerPoint for improved accessibility. A tool available in Microsoft Office 2010 and 2013 for Word, PowerPoint, and Excel that identifies areas within documents that may be problematic for users with disabilities to view or use. Inspects the document and scans for issues that could pose problems. Generates a report showing the inspection results. Flags three different categories of issues: errors, warnings, and tips. Why Fix: Provides additional information detailing why the issue should be fixed. How To Fix: Provides instructions for fixing the problems. The W3C, World Wide Web Consortium, the international community that develops open standards for the web, has created a resource providing guidance on applying WCAG 2.0 standards to non-web information and communication technologies. For a demonstration of techniques you can use to format your MS Word document for improved accessibility view the AccessGA webinar recording: Creating Accessible Microsoft Word Documents, PowerPoint Presentations, and PDFs. There are also a number of how-to guides and checklists available on the AccessGA Wiki Content Accessibility page.